What’s in a name in 1914, in 2014? This month, starting 25th of August, the University of Glasgow will host the 25th International Congress of Onomastic Sciences, the premier conference in the field of name studies. For this occasion, we have started to calibrate NamSor software to recognize Scottish names. 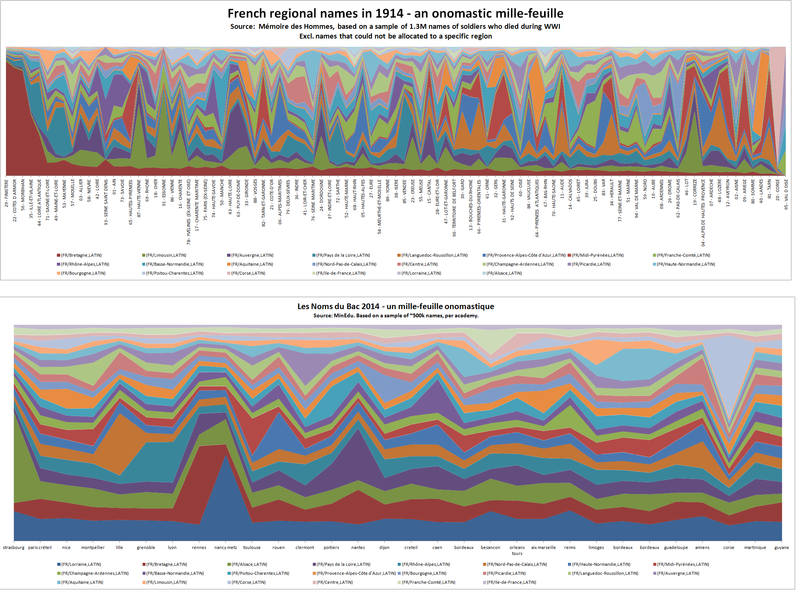 This is work in progress, but I’d like to share some preliminary data visualizations of regional names. 2014 marks 100 years since the start of the First World War. All across Europe and beyond, families lost dear ones, children were raised without knowing their father and grand-children were born in the aftermath of this trauma – only to live another global war, WWII. Let’s respect the people who died in both wars, and let’s also listen to the message their names convey to us about who they were, about who we are. What do personal names tell us about the world in 1914? We’ve found a majority of Scottish names in regiments such as: the Gordon Highlanders, the Mercantile Marine Reserve, the Royal Scots, the Cameron Highlanders, the Seaforth Highlanders, the King’s Own Scottish Borderers and also the Royal Flying Corps. 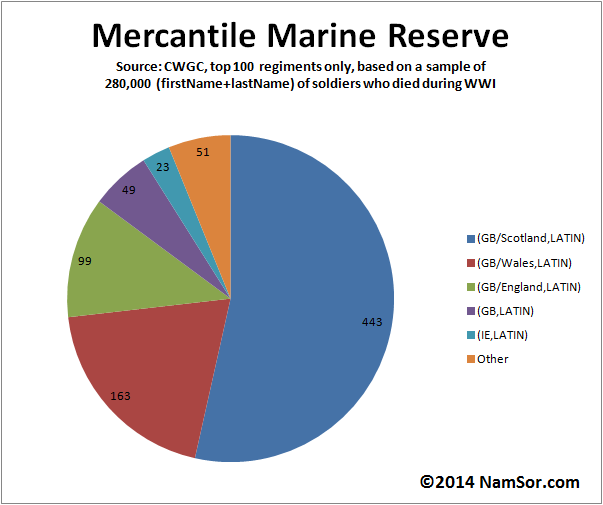 This pie chart tells us that the Mercantile Marine Reserved was composed mostly of Scottish and Welsh soldiers. By looking at the soldiers ranks for that particular regiment, we can produce a new onomastic mille-feuille : names DO matter when it comes to rank in 1914. In more easily understandable pie chart language, this means that the Firemen were mostly Scottish and Welsh, whereas the Carpenters were English. The first world war started as a European war but populations from Africa, Asia were immediately mobilized by the colonial powers of the time : the British Colonial Empire, France, … many soldiers came from far away to meet their death in the tranchées of Eastern France. We can again use an onomastic mille-feuille to visualize the correlation between names and geography, but here a classic geographical map would probably tell a better story. 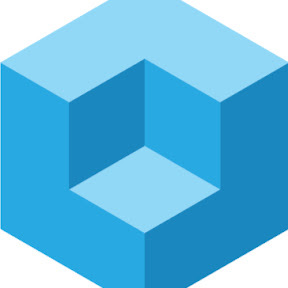 Distinctive patterns are recognized in names from Bombay, Madras, Delhi or Pashawar, allowing the software to cluster them into distinct onomastic classes. We display here some examples of typical names from different regions. Can you see how different they are? IT/Abruzzi e Molise: MEZZACAPPA GIUSEPPE DI ANTONIO, PAOLILLI-TREONZE PASQUALE DI DOMENICO, BONITATIBUS ERMANNO DI ANGELO, FIDELIBUS ANGELANTONIO DI EUGENIO, PAOLILLI-TREONZE DONATO DI GAETANO, VASQUENZ AUGUSTO ANGELO DI ANTONIO, AMMAZZALORSO ANTONIO DI ANGELO. IT/Basilicata: LATERZA GIOVANNI DI GIUSEPPE, SCAMORCIA GIUSEPPE DI GAETANO, ALAGIA NICOLA DI GIUSEPPE, CLAPS VITO CANIO DI GAETANO, CLOROFORMIO VITO DOMENICO DI TADDEO, SCANDIFFIO DOMENICO DI INNOCENZO, CLAPS ANGELO VITO DI VITANTONIO, CASAMASSIMA FRANCESCO PAOLO DI GIOVANNI, PENNIMPEDE GIUSEPPE DI PIETRO. IT/Calabria: PROCOPIO FRANCESCO DI NICOLA, CANDREVA FRANCESCO DI GIUSEPPE, SCICCHITANO FRANCESCO DI GIUSEPPE, SPACCAROTELLA GIOVANNI DI ANGELO, CICCIU CONSOLATO DI ANTONIO, LULJ GIUSEPPE DI VINCENZO, TRUNCELLITO DOMENICO PASQUALE DI GIUSEPPE, DAVOLOS DOMENICO DI PASQUALE, CHIDICHIMO GIOVANNI DI SALVATORE. IT/Campania: ANNUNZIATA GIOVANNI DI ANTONIO, PISCOPO GIOVANNI DI ANTONIO, PISCOPO GIUSEPPE DI ANTONIO, SARRAPOCHIELLO LORENZO DI NICOLA, GENETIEMPRO GIUSEPPE DI MATTEO, VALIANTAE ANIELLO DI CARMINE, DONNIACUO ALFONSO DI GIUSEPPE. IT/Emilia-Romagna: SCHIAVAZAPPA BONFIGLIO DI CRISTOFORO, SAVRIE ADELCHI DI GIUSEPPE, VACONDIO BONFIGLIO DI PIETRO, GUAGLIUMI GEMINIANO DI CESARE, ASTROLOGI GIOVANNI DI FERDINANDO, SAVRIE GIUSEPPE DI PRIMO, GUAGLIUMI GIOVANNI DI LEANDRO, MANSERVIGI GIOVANNI DI SALINGUERRA. IT/Lazio: ASTROLOGO ANGELO DI PACIFICO, FAPERDUE SALVATORE DI VALENTINO, CENTOSCUDI NAZZARENO DI SANTE, CARLODALATRI UMBERTO DI FRANCESCO, CAPPADOCIA GIUSEPPE DI GIOVANNI, SCHIETROMA GIUSEPPE DI PASQUALE, PALAMIDES GIOVANNI DI GIUSEPPE, GIANFERMI GIOVANNI BATTISTA DI DOMENICO, CAPPADOCIA AMEDEO DI GIUSEPPE, PIETROBONO GUGLELMO DI BENIAMINO. IT/Liguria: GAGGERO GIOVANNI BATTISTA DI GIUSEPPE, KONIG GIOVANNI BATTISTA DI GIOVANNI BATTISTA FILIPPO, MONTEGHIRFO GIOVANNI DI LUIGI, MAGIONCALDA GIOVANNI BATTISTA DI GIOVANNI, BACIGALUPO GIOVANNI BATTISTA DI DOMENICO, REDEGOSO GIOVANNI BATTISTA DI BARTOLOMEO, KONIG GUGLIELMO DI PIETRO, ARBOCO GIOVANNI BATTISTA DI EMANUELE VINCENZO. IT/Lombardia: SANTAMBROGIO GIUSEPPE DI FRANCESCO, RUEFF GIOVANNI DI GIOVANNI, RECALCATI GIUSEPPE DI AMBROGIO, TAGLIABUE GIUSEPPE DI ANGELO, RANZENIGO FRANCESCO DI GIOVANNI, PIANTANIDA ANTONIO DI FELICE, SALMOIRAGHI GIUSEPPE DI ATTILIO, CONSONNI GIUSEPPE DI DOMENICO. IT/Marche: CUCCU GIUSEPPE DI FRANCESCO, FIORDOLIVA GIUSEPPE DI PACIFICO, CINGOLANI NAZZARENO DI PIETRO, ANGELOME MARONE DI GIUSEPPE, VOLTATTORNI NAZZARENO DI FRANCESCO, CARSTANJEN GUSTAVO DI PAOLO, MENGHI-CERRA NAZZARENO DI DAVID, VOLTATTORNI CIRIACO DI LUIGI, CARSTANJEN EDOARDO DI PAOLO, BRUZZECHESSE DOMENICO DI FRANCESCO. IT/Piemonte: DESTEFANIS GIOVANNI DI GIUSEPPE, RIVOIRA GIOVANNI DI PIETRO, CUTTICA GIUSEPPE DI CARLO, BELLINO-ROCI GIUSEPPE DI NICOLAO, NEPOTE GIOVANNI DI DOMENICO, AIMAR BARTOLOMEO DI BARTOLOMEO, LANTELME GIORGIO DI FRANCESCO, GUELPA GIOVANNI DI GIOVANNI, VALSANIA GIOVANNI DI ANTONIO, ARNEODO GIUSEPPE DI GIOVANNI. IT/Puglia: SPAGNULO COSIMO DAMIANO DI FRANCESCO, VANTAGGIATO GIUSEPPE DI VINCENZO, SEMERARO GIOVANNI DI GIUSEPPE, EPICOCO DOMENICO DI GIOVANNI, AGHILAR RUGGIERO DI LUIGI, CANNABONA CROCIFISSO DI PASQUALE, BAGLIVO CROCIFISSO DI ORONZO, SPEDICATO CROCEFISSO DI SALVATORE, GIANCANE CROCIFISSO DI RAFFAELE. IT/Sardegna: MARONGIU SALVATORE DI ANTONIO, PORCU GIOVANNI DI FRANCESCO, MARONGIU FRANCESCO DI SALVATORE, PUTZOLU GIOVANNI DI GIUSEPPE, DESOGUS GIOVANNI DI ANTONIO, MURTAS GIOVANNI DI GIUSEPPE, LAMPIS ANTIOCO DI FRANCESCO. IT/Sicilia: RAPISARDA SALVATORE DI GIUSEPPE, GIONFRIDDO PAOLO DI SALVATORE, MACALUSO GIUSEPPE DI GIUSEPPE, SPAMPINATO ANTONINO DI GIUSEPPE, PRIVITERA ANTONINO DI GIUSEPPE, SCACCIANOCE SALVATORE DI ROSARIO, RAPISARDA SALVATORE DI CARMELO, CANGIALOSI ANTONINO DI MICHEL. IT/Toscana: SCHIUMARINI IACOPO DI ANTONIO, DIOLAIUTI FERRUCCIO DI GIULIO, MAZZEI EFREM DI GIUSEPPE, DELL’EUGENIO ANGIOLO DI ANTONIO, DELL’ARINGA GABBRIELLO DI DANIELE, PISTOI ASTAROTTE DI OLIMPIO, BIENTINESI MILZIADE DI GIOVANNI, ANZEMPAMBER FILIPPO DI ADOLFO, BEMPORAD DUILIO DI POLICARPO, DELL’OMODARME RANIERI DI DEMETRIO. IT/Trentino-Alto Adige: DALPIAZ GIUSEPPE, ANDERLE GIOVANNI, DEVIGILI GIUSEPPE, PONTALTI GIUSEPPE, CASAGRANDA GIUSEPPE, FLAIM GIOVANNI, PALLAORO GIUSEPPE, STEDILE GIUSEPPE, DETASSIS GIUSEPPE, DELVAI GIUSEPPE. IT/Umbria: DESANTIS GIUSEPPE DI DOMENICO, MAGARINI-MONTENERO DOMENICO DI BONAVENTURA, QUONDAM GIOVANNI DI NAZZARENO, GAMBELUNGHE SALVATORE DI CESARE, CENTOGAMBE DOMENICO DI FELICE, QUONDAM CASTORINO DI GIUSEPPE, BESTIACCIA GIOVENALE DI GIUSEPPE, BELLACHIOMA ASTORRE DI ALBERTO, SFORNA CRISPOLTO DI NAZZARENO, CENTOGAMBE GIUSEPPE DI PIETRO. IT/Veneto: DELL’OSBEL GIOVANNI DI ANTONIO, MESTRINER GIOVANNI DI GIUSEPPE, RODIGHIERO GIOVANNI DI ANTONIO, BOF GIOVANNI DI LUIGI, DALL’OSTO GIUSEPPE DI PIETRO, SKREZENEK GIUSEPPE DI CARLO, FILOSOFO GIOBATTA DI PAOLO, MENEGUZ GIOBATTA DI ANTONIO, MESCALCHIN GIOBATTA DI ANDREA, CIPOLAT-GOTET GIOVANNI DI GRAZIADIO. 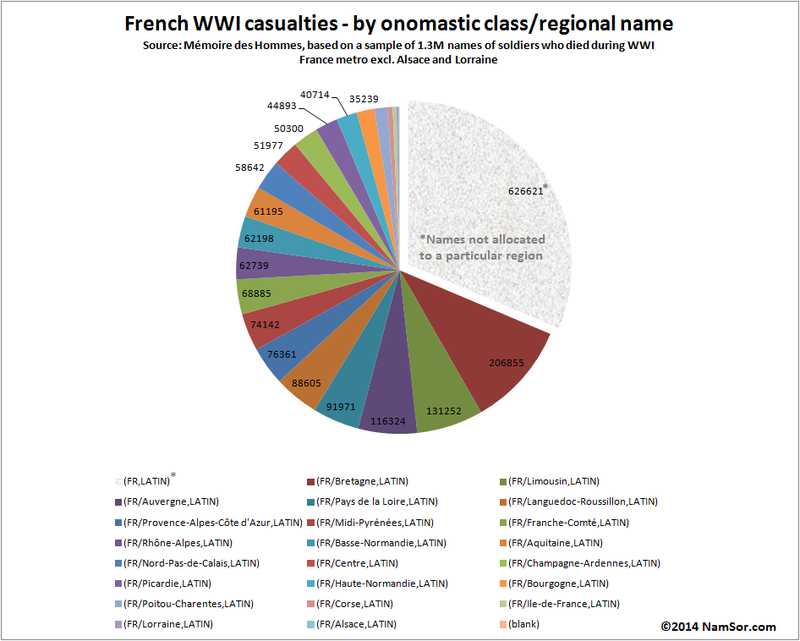 We can also view the total number of casualties, broken down according to the onomastic class. It show the large number of people originally from Brittany who died during WWI, regardless of their birthplace. However, this remains debatable – as ~30% of names could not be specifically allocated to a region of origin (only recognized as French). Baptiste COULMONT, a sociologist, published a very interesting study on given names analysing the results of students at the French Baccalaureate in 2014. 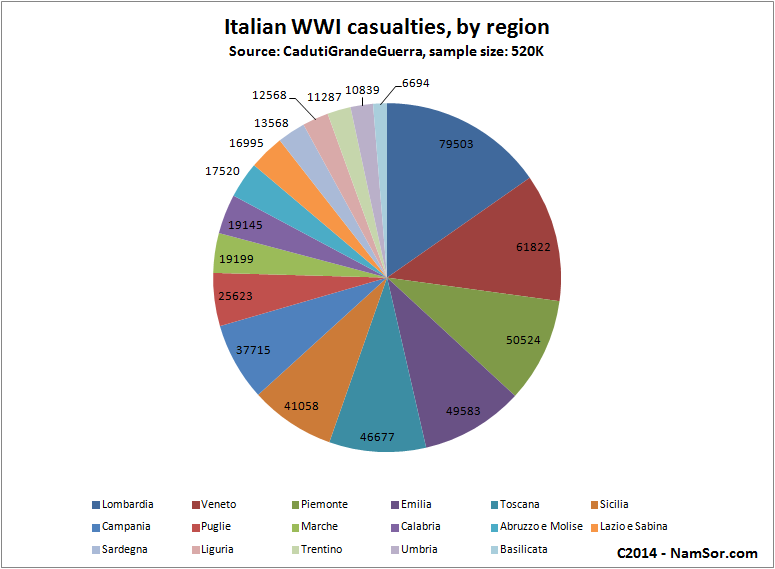 We’ve used a similar dataset compare regional names in 1914 and in 2014. Unfortunately, we didn’t have enough time to align the geographic mappings – but the result is visual and self-explanatory. We can see how rural exodus and internal migration have eroded the regional identity in personal names. Still we can see that even in 2014, the correlation between onomastics and geography remains strong – especially in Brittany, in the North of France, in Alsace, in Lorraine, in Loire, in Lyon, in Aquitaine and Corsica. What do names tell us about the world in 2014? A lot! Some say: too much! NamSor is committed to promote diversity and equal opportunity and launched GendRE API, a free API to conduct analysis of gender equality using open data.